Macedonia prides itself on many splendid tourist destinations which will certainly impress you. 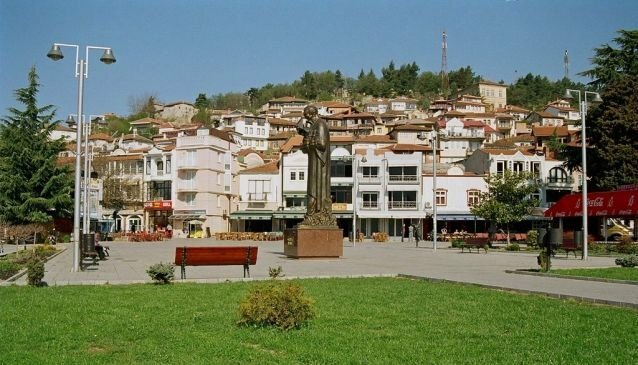 One of them is the beautiful city of Ohrid which is an attractive place during the whole year. You will definitely love the long and relaxing walks through the spacious Central Square. Here you will have a chance to spend quality time with family or friends, you can enjoy long promenades in a vivid ambiance surrounded by friendly people. Also, you will notice the positive energy and the vividness that fulfill the Square. After walking, relax sitting on some of the desks situated all through the Square and enjoy listening to the stories about this beautiful city that many locals will retell. Furthermore, you can enjoy strong coffee, icy-cold drinks and delicious food in some of the bars and restaurants located around the Square. At the same time, you will capture breath-taking views of the crystal blue Ohrid Lake and the splendid buildings which possess unique architectural style.